(Photo: Vatican News)Pope Francis on April 11, blesses one of the electric racing cars that will compete in the Formula E race in Rome on April 14, 2018. Pope Francis has greeted a delegation of the Formula E World Championship present at his weekly general audience and blessed one of its fully-electric racing cars. 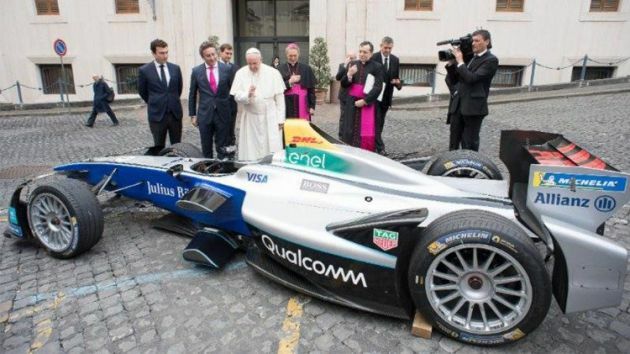 One of the pioneering fully-electric racing cars that will compete in April 14's Rome Formula E race, roared into the Santa Marta courtyard in front of Pope Francis' residence on the morning of April 11 to be blessed by the environmentally aware pontiff, Vatican News reports. Later in the day, after his weekly General Audience in St. Peter's Square, the Pope had a special greeting for a team of managers, mechanics and drivers representing the Formula E Championship, the world's first fully-electric international single-seater street racing series. Pope Francis is author of "Laudato Sì – On the Care for Our Common Home" his second encyclical, a papal document. It describes itself as "racing reinvented" and consists of 10 teams and 20 drivers, Formula E delivers world-class racing to 10 cities over five continents, throughout the seven-month Championship season. Its protagonists assert that the Formula E Championship is more than just a racing series. It provides a competitive platform for car manufacturers to test and develop electric vehicles and improve the "zero carbon emissions" driving experience for everyday road car users all over the world. The ABB FIA Formula E Championship says it is the world's first fully-electric international single-seater street racing series. It brings racing rivalries to city streets, set against some of the most iconic skylines in the world - such as New York, Hong Kong, Paris and Rome. In 2012, the concept of all-electric international single-seater racing was born. , Jean Todt, the president of FIA, the governing body of world motor sport, developed the idea as a means to demonstrate the potential of sustainable mobility. Since making its global debut in the grounds of the Olympic Park in Beijing in 2014, Formula E includes some of the world's best drivers, teams and manufacturers.